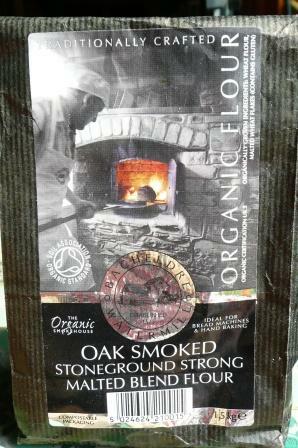 Yes, you read that right – oak smoked flour from Bacheldre Watermill – and with that great packaging, how could I resist? Actually it’s oak smoked stoneground strong malted blend flour and as I don’t share the English predilection for malty bits in my bread I thought my first loaf rather ho-hum. The smokiness was enjoyable though, and quite a bit cheaper than setting up a wood-fired oven. Possible solution: I sifted out those malty bits and fed them to the birds then made a fresh batch of dough, but the resultant loaf was still too worthy, in a knitted oatmeal kind of way, albeit with a crust to stop traffic (literally). My solution: blend it with regular flour at a 1:5 ratio. 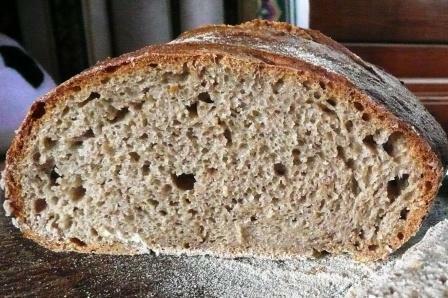 Result: a whiff of wood smoke and wheatiness with an excellent rise. Better than saving up for a wood-fired oven any day.